The confines of modern society provide few opportunities to test one's barbarous warrior spirit, at least now that Slamball no longer holds open tryouts. 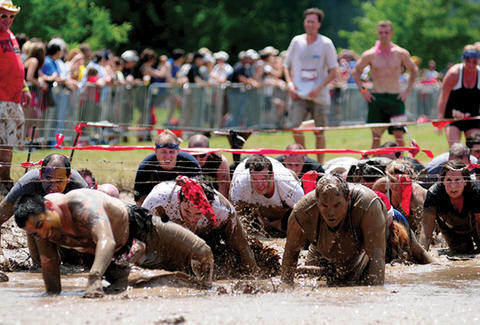 For a new proving ground to tramp over: Warrior Dash. 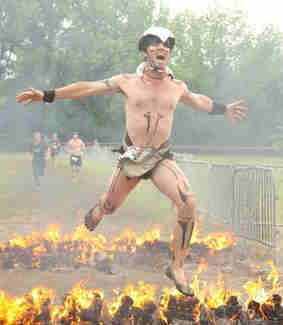 Held on the desolate shores of Lake Elsinore, SoCal's second ever Dash is a brutal, will-testing 3.8mi course of hellish obstacles over which would-be warriors will crawl, scramble, limp, and most likely cry, all in the hopes of winning glory, and for top finishers: engraved steel warrior helmets -- what, they couldn't afford Cascades?! Assuming you don't win for best costume (past ones include Vikings, Spartans, and a made-up race called "Huns"), you'll have to win said headgear by braving a completely re-jiggered upgraded course, clawing over an 8' Great Warrior Wall, sloughing through the muck of the Slithering Swamp (which's actually "not too deep, just pretty nasty"), and scrambling amongst Hay Fever's pyramids of bales -- which are hopefully too distracted by the boom mic guy to notice you're there. Make it through those, and you'll still have to "Walk the Plank" (which's suspended six feet over a jagged-rock filled gully), bounce your way through the "Rubber Ricochet" and its rope-swinging tires, fall over logs in waist deep water, hurdle over fire pits (2x as many as last year! ), and finally hit "Muddy Mayhem" to prone-crawl through muck under an entanglement of barbed wire, though considering it was mostly about Pam Anderson's jugs, it really didn't need to be so complicated. To drown your sorrow, celebrate your success, or just acknowledge that it's the weekend, hit their post-race party with furry viking helmets for everyone and a 34oz stein-serving beer garden, all outside the Storm stadium -- actually a great place for ex-Slamballers to find work. Hey, someone's gotta clean up the parking lot!